The iPad keyboard works quite well for general typing. Where it falls short is accessing the extended keys such as @, *, #, [ and alike. Forget trying to type a tab character on the standard iOS keyboard. It's not available in most applications. The tab requires a developer to implement a custom keyboard like Nebulous Notes (which is rare). Consequently, a user is required to tap the ". ?123" key on either side of the space key to access most of the special keys. It's even worse if you need a square bracket or hash symbol. To access those keys you need to additionally tap the "#+=" key to access a third keyboard. Many third party apps now support TextExpander Touch for snippet expansion. Great! I can use TE to expand all those Markdown characters from the standard iOS keyboard. After much experimentation, I developed a memorable, consistent and convenient set of TE snippets for Markdown on iOS keyboards. These snippets can all be accessed from the main iOS keyboard. Related snippets simply differ by the number of comma characters. In the definitions below "(space)" is meant to represent the space character. I wanted to highlight it specifically in this post because as with any language white space in Markdown is important to me. 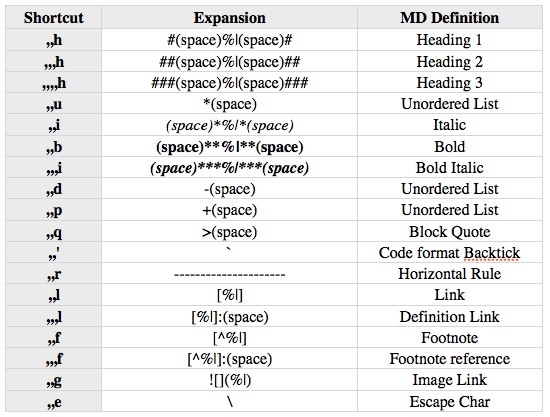 Additionally, the characters "%|" are specific to TextExpander. After expanding the snippet, the insertion cursor is paced at the position marked with "%|"
Finally, I have two additional snippets for general use. I user the @ symbol to begin tags.